Gimpel Fils are delighted to announce the opening of their innovative new gallery on Thursday 22 March 2001. Over the past three months the exhibition space has undergone a complete refurbishment to a design by architect Will White. For the inaugural exhibition, Gimpel Fils have invited Richard Wilson to create another installation of drawings and models, following on from the highly successful Formative Processes in 1996. In contrast to Wilson's previous exhibition, the new installation concentrates solely on one recent work. A new sculptural installation using drawings and models documents the creation of the permanently sited sculpture Set North for Japan ( 74º 33' 2") installed in Nakasato Village, Niigata Prefecture, Western Japan, last summer. For the sculpture the artist transposed a full scale metal-frame reconstruction of his own, rectilinear London terraced house to the Japanese countryside. The house maintained its original perpendicular and horizontal orientation which means that in Japan the structure rises out of the ground at a displaced angle. It is as if the house had broken free of its foundations in London and crashed back to earth upside-down on the other side of the world. For the exhibition, three 150cm x 120cm drawings will be mounted on to a 12 metre long industrial pipe, which rotates slowly on rollers. A model of the house will also be mounted on a pivot, allowing it to maintain its position independent of the movement of the pipe. Influenced by a visual collage of information found in Japanese newspapers, the drawings are groupings of material from the entire process of realising the sculpture. The artist's earliest concept drawings, his technical processes and final designs are combined with engineers' drawings, computer simulations, location research and snap shots of the installation and opening ceremony. The new works attempt to convey the complex processes and collaborations necessary to realise a major sculpture of this kind. 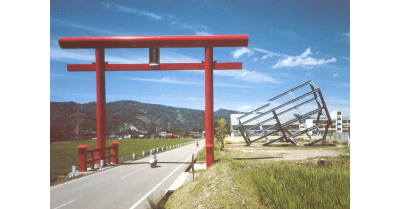 Note to editors: The sculpture Set North for Japan ( 74° 33' 2") was commissioned for Echigo-Tsumari Art Triennial 2000, curated by Fram Kitagawa. The realisation of the work was made possible by sponsorship from the Maeda Corporation, Japan.